Clason's Guide Map of Idaho. This is an attractive example of G. S. Clason's c. 1920 Guide Map of Idaho. Issued to accompany Clason's Idaho Green Guide, this folding map covers the entire state of Idaho. An index on the upper right quadrant of the map lists cities and towns with populations and key to the map. A legend shows the state capital (Boise), county lines, county seats, railroads, rail trunk lines, electric rail road lines and national forests. The boundary lines between Idaho and the neighboring states of Washington, Oregon, Nevada, Utah and Wyoming are marked along with the boundary line between Idaho and Canada. Yellowstone National Park in Wyoming is identified. The verso features Clason's road map of Idaho, showing paved roads, all weather roads and other thoroughfares, includes an index of cities, towns, and population statistics. The Green Guides were published by the Clason Map Company between 1906 and 1931. 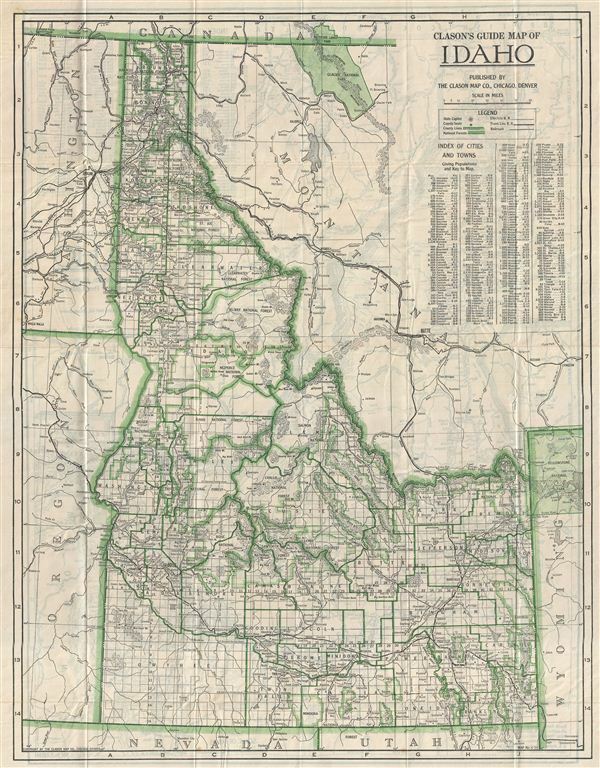 This guide map of Idaho was created by George Clason and published by the Clason Map Co., Chicago, III., Denver, Colorado for issue with Clason's Idaho Green Guide. George Samuel Clason (1874 - 1957) was born in the city of Louisiana, Missouri in 1874. As a young man, Clason studied at the University of Nebraska before joining the United States Army to fight in the Spanish American War. After the war, he moved to Denver, Colorado where he founded the Clason Map Company of Denver, thus starting his lucrative publishing career. As the company expanded, Clason opened a secondary office in Chicago, Illinois - then a rising map publishing center and railroad hub. At least one other satellite office was opened in Los Angeles. Among his many achievements, Clason is credited with producing the first modern road atlas of the United States. In the late 1920s, Clason also published a series of get-rich-quick pamphlets in the form of parables. The most famous of these is The Richest Man in Babylon. This tells the story of Arkad, a citizen of Babylon famed for his great wealth and generosity who shares his wit and wisdom with his fellow Babylonians. Clason, G., Clason's Idaho Green Guide, 1920. Very good. Original fold lines visible. Minor verso repair to some original folds. Clason's road map of Idaho on priinted on verso.